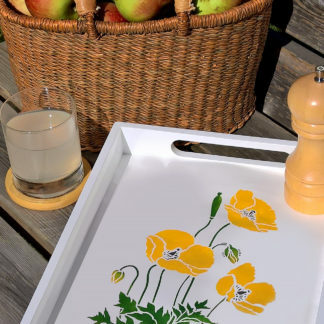 View cart “Large Wild Poppies Theme Pack Stencil” has been added to your cart. The beautiful Little Buddleia Stencil is perfect for botanical wild flower stencilling projects. 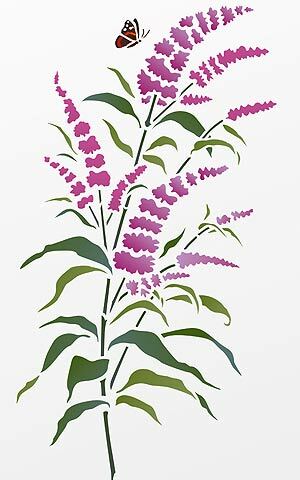 This stencil of a small spray of buddleia is based on Henny’s buddleia studies and sketches and is an extremely versatile stencil. Ideal for beginners. 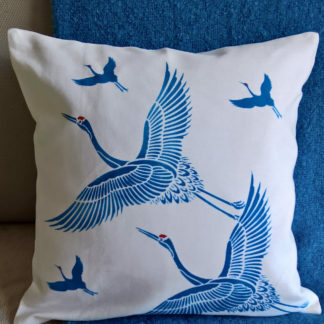 Great for cushion covers, scarves, handkerchiefs, or for home accessories, such as frames and boxes and great for paper and craft work such as gift cards and wrapping. Also comes with a tiny beautiful Red Admiral motif in two layers. See size specifications below. 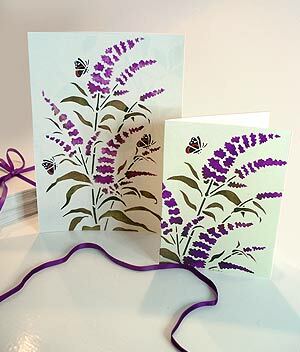 Above and below – the Little Buddleia Stencil has been used to transform plain gift cards. 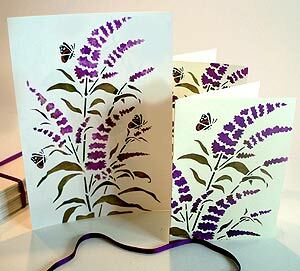 Stencilled in Indian Purple, Agapanthus (flowers), Olive Grove and Woodland (stalks and leaves) on cream coloured A5 and A6 cards. Butterfly in Jet Black, Ice White and Very Berry Stencil Paints. 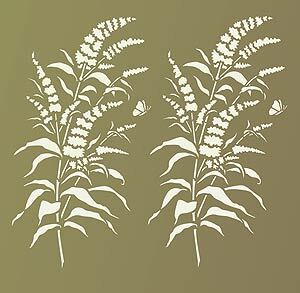 Above – Little Buddleia Stencil shown repeated horizontally in Grassland and Vanilla Stencil Paint. 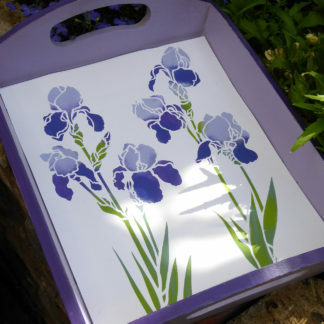 Use our Stencil Sponges for this stencil – they are great for some of the tight cut out shapes and get really good results. 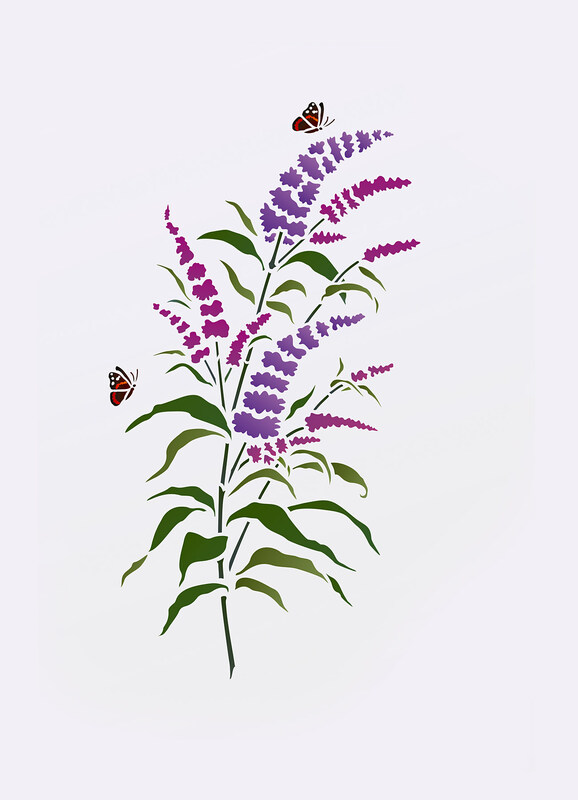 Also see the Buddleia Stem Stencil, Buddleia Butterfly Bush Stencil and our Red Admiral Butterfly Stencils. 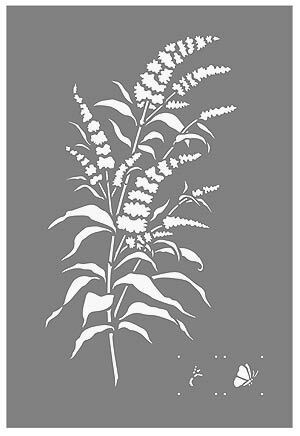 Above and below – create charming picture frames with the Little Buddleia Stencil. 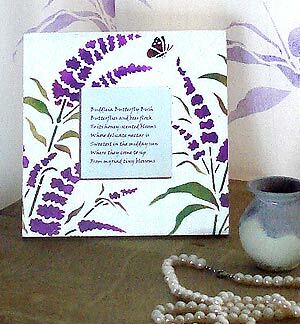 Here in Indian Purple, Agapanthus (flowers), Woodland and Yellow Ochre Stencil Paints (leaves and stalks). 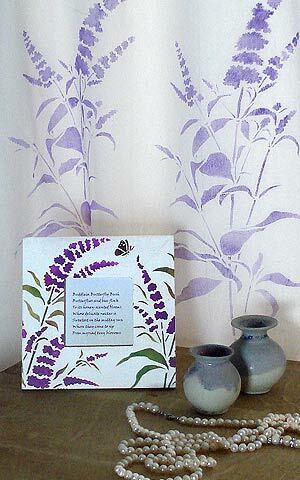 Above – the charming motifs of the Little Buddleia Stencil are echoed in the hanging voile curtain stencilled with the larger simple motif of the Buddleia Stem Stencil in Motif Fabric Paints. 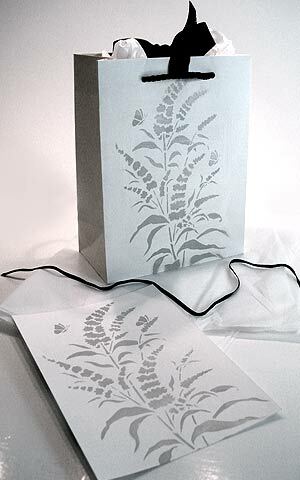 Above – the Little Buddleia Stencil has been stencilled simply in Shoreline Stencil Paint and over-stencilled with Pearl Metallic Stencil Paint on white cards and gift bag. 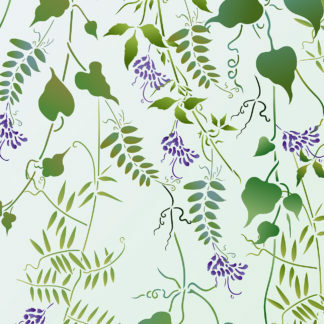 A simple and quick way to create stunning gift wrap and cards. 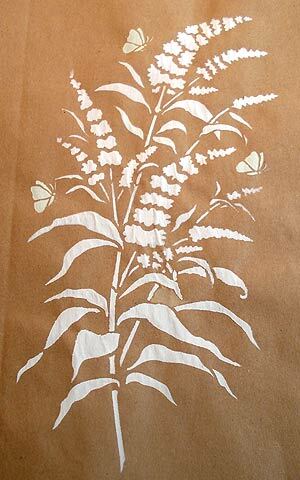 Above – the Little Buddleia Stencil in simple Ice White Stencil Paint on brown paper – a quick and easy way to create fashionable botanical gift wrap. 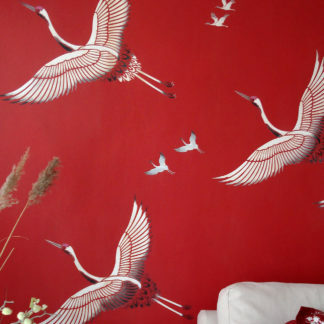 Above – the Little Buddleia Stencil shown in Cerise, Damson (flowers), Eucalyptus and Olive Grove Stencil Paints. 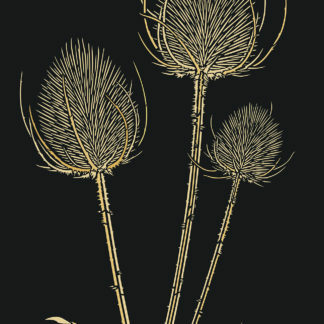 One layer stencil on one sheet of 125 micron Mylar. Comes with additional two layer butterfly motif and registration dots for aligning the wing markings. 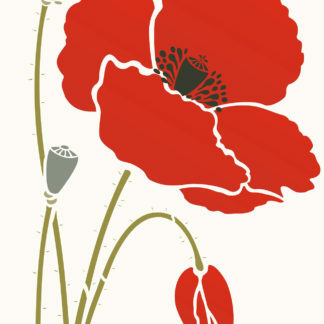 Overall motif measures up to 14cm/5.5″ wide x 25.7cm/10″ high. 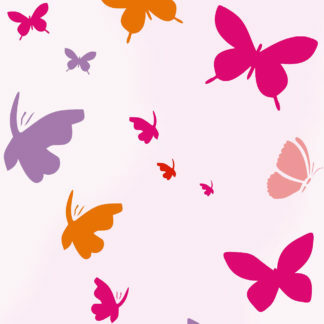 Butterfly motif up to 1.8cm/.75″ wide. Sheet size 21cm/8.5″ wide x 31cm/12.25″ high.